Jupiter and the moon will meet up in the night sky on Feb. 3, 2015. The planet will be just to the left of the moon. Look to the eastern sky tonight (Feb. 3) after dark to see an amazing sight. If your sky is clear early this evening, about an hour after sundown, you might be able to see the February full moon — sometimes known as the "Snow Moon" — shining with the giant planet Jupiter in the east-northeast sky. 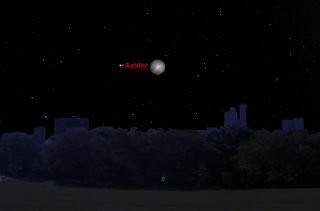 Jupiter should be located to the left of the moon. Both the moon and planet will keep each other company as they move across the night sky through the course of the night. Jupiter will reach opposition on Feb. 6, meaning that it will be opposite to the sun in Earth's sky that day. Therefore, Jupiter rises around the time the sun sets, shines highest at around midnight and setting around sunrise. Opposition is also when Jupiter is closest to the Earth for the year, appearing biggest and brightest. Look for it in the east as the blue sky darkens. When you face Jupiter, Venus is almost directly behind you. For amateur astronomers, Jupiter is a superb telescopic object. Its disk shows more illuminated surface area than all the other planets combined. Users of the very smallest telescopes or even steadily held binoculars can identify some or all of four of Jupiter's bright moons at any given time. But the planet's disk itself also draws a lot of attention. In large telescopes interested observers can view its cloud belts. Sometimes, one or more of the belts can look strongly disturbed, full of knots and sprouting festoons. On the other side of the coin, however, the cloud belts might look more like pale belts crossing the planet. As always, seeing details on Jupiter requires a good quality telescope, good atmospheric seeing and patience behind the eyepiece. Lastly, if clouds hide your view of the moon and Jupiter, don't fret. The two cosmic objects will shine together again in about one month, on March 2. Editor's note: If you snap an amazing skywatching photo of Jupiter and the moon or any other night sky view, and you'd like to share it for a possible story or image gallery, please contact managing editor Tariq Malik at spacephotos@space.com.